Bhatt's motive comes under suspicion for two reasons. Firstly, his belated action in coming out with these allegations. Secondly, the questions that have been raised regarding the correctness of his claim that he was present at Modi's meeting whereas some participants have reportedly denied it. 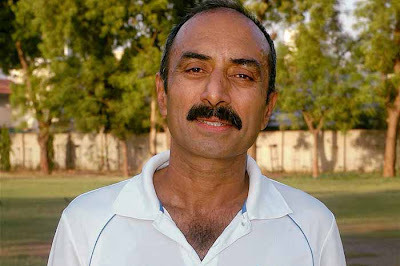 (April 30, Chennai, Sri Lanka Guardian) The tussle between Shri Narendra Modi, the Chief Minister of Gujarat, and Shri Sanjiv Bhatt, an Indian Police Service Officer of the Gujarat cadre presently posted in Junagadh, is becoming murkIer and murkier---not reflecting well on either Modi or Bhatt. 2. The tussle has given rise to suspicions of petty-mindedness and vindictiveness on the part of Modi and a motivated unprofessional agenda on the part of Bhatt. 3. The present tussle started with an affidavit reportedly filed by Bhatt before the Supreme Court, alleging that Modi had instructed officers during a late night meeting held on February 27, 2002, to allow Hindus "to vent out their anger" during the clashes as he wanted Muslims to be "taught a lesson" after the massacre of some Hindu pilgrims by some Muslims at the Godhra railway station. There is nothing new about these allegations. Such allegations had repeatedly been made by the detractors of Modi from time to time since 2002 without their being able to prove them. Nor has Modi been able to disprove them in a convincing manner. 4.The only way of convincingly disproving them is by producing the minutes of the meeting held on February 27,2002, and the Roznamcha (General Diary) entries of the relevant police stations after the reported meeting of Modi.If the allegations against Modi are correct, this would be reflected in the lack of any reference in the Roznamchas to additional police deployments. If the allegations against Modi are wrong, such additional deployments would be reflected in the Roznamcha entries. The silence of the Gujarat Government all these years regarding entries in relevant records would give ground for suspicion that for some hours after the Godhra incident no written records were kept, particularly of the meeting reportedly held by Modi. 5.Bhatt's motive comes under suspicion for two reasons. Firstly, his belated action in coming out with these allegations. Secondly, the questions that have been raised regarding the correctness of his claim that he was present at Modi's meeting whereas some participants have reportedly denied it. Bhatt and his supporters have produced a statement of Bhatt's driver to show that Bhatt did attend the meeting, According to the driver, Bhatt travelled to the meeting in the car of a colleague and the driver drove Bhatt's car behind them. If this is so, this should have been reflected in the duty register of Bhatt's car. If there is an entry in the duty register of Bhatt's car, Bhatt is probably right and Modi's supporters are telling a lie. If there is no entry, Modi's supporters are probably right and Bhatt is telling a lie. Why has the Gujarat Government not released so far the relevant entries in the duty register of Bhatt's car ? 6. The tussle has been made more complicated by Bhatt's allegation that his security cover has been withdrawn after he filed his affidavit. This has been denied by the office of the Director-General of Police, according to which Bhatt's security entitlement has been reduced, but not withdrawn. Bhatt had been given a security entitlement of five security personnel of which four have been withdrawn. 8. A large number of Tweets recveived by me have claimed that this was purely a professional decision taken in the police department and that it will, therefore, be incorrect to blame Modi for it. Bhatt's case is unique----whatever be his motives in filing the affidavit. He had made serious allegations against Modi. If Modi was sensitive enough, he would have ensured that nothing was done either by his office or by the DGP's office which could be misconstrued as vindictiveness. By failing to act till now, Modi has strengthened the impression that there is more than meets the eye in the dilution of the security provided to Bhatt. 9. In recent months, Modi has been trying to project a positive image of himself as a good and progressive Chief Minister---with some success. The way Bhatt's case has been handled---it is immaterial whether it was done by his office or by the DGP's office--- would provide credibility to those who have not been convinced of the genuiness of this positive image and have been arguing that it is the same old vindictive Modi who has been ruling Gujarat. 10. The shadow of his alleged post-Godhra vindictive reflexes continues to follow Modi wherever he goes and whatever he does.He may not be able to shake off this shadow unless he comes out with a white paper giving details of all actions taken by him and the police after the Godhra massacre, supported by relevant records of his office and the police.